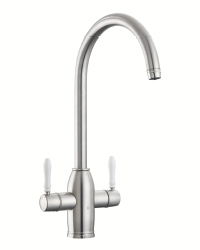 The AGA 4-in-1 Tap offers all the benefits of a kitchen mixer tap but with the addition of PH balanced, limescale-free, filtered cold water and filtered steaming hot water, meaning you can make the perfect cup of tea in an instant. 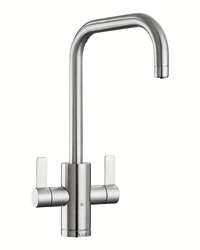 Capable of delivering more than 100 cups of tea per hour, the steaming hot water is delivered safely by the use of an innovative child safe magnetic HotFob placed on the front of the tap. 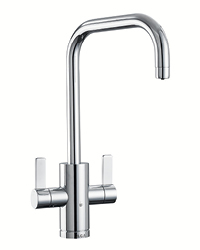 These beautifully engineered taps are available in two styles – Modern and Traditional – not only do they perform brilliantly and look stunning, there’s also a design that’s perfect for every kitchen style. AGA is offering a nationwide fitting service and the taps can be installed as part of a larger kitchen project or retro-fitted to an existing sink and – whichever style you choose – you can be sure of impressive functionality and stylish good looks. Superbly engineered, exquisitely finished and using patented technology, the AGA 4-in-1 Tap Collection is designed and manufactured in the UK to the highest standards and comes with a five year warranty (five year warranty on tap, two year warranty on boiler).